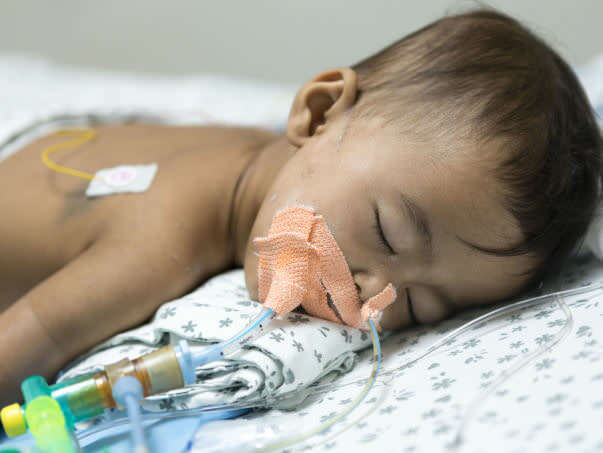 A smiling, playful baby who was happy to play in any one’s arms, 1-year-old Junera has been fighting pneumonia in the ICU for the last three weeks. She is unable to breathe and has been put on the ventilator. 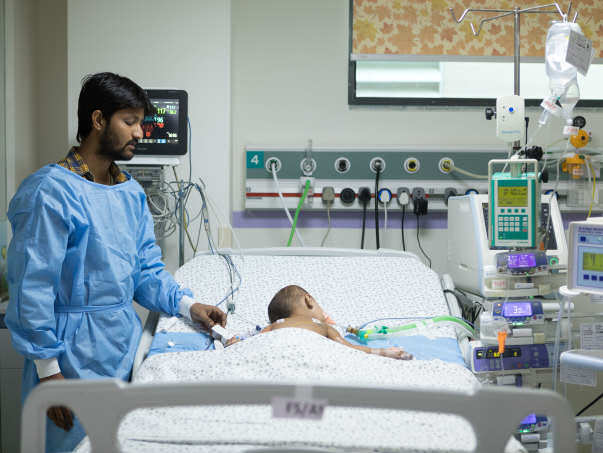 She needs to remain in the PICU for at least a few weeks more but her father, a small-time daily-wage worker has absolutely nothing left to save her. Because Junera can't breathe, her oxygen levels have dropped drastically. She needs a more effective form of ventilation, a high-frequency oscillator. She is battling for her life and her entire system is at risk of failure even before she finished two years of life. 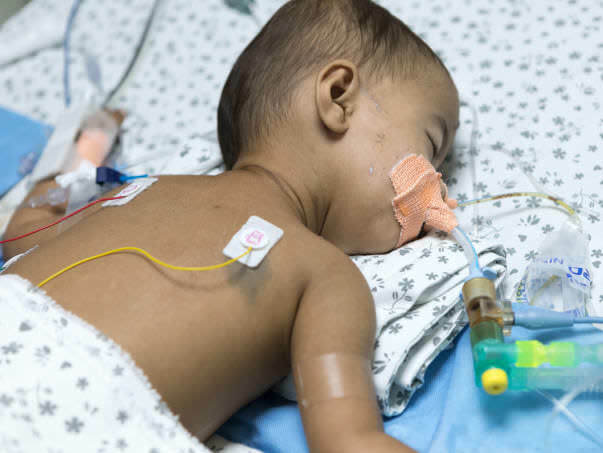 Apart from breathing, Junera is suffering from other complications due to extremely depleted oxygen levels. Now, her brain has shown some problems and she might need a CT Scan too. This all began suddenly when the 18-month-old would cough weirdly and for extended durations. 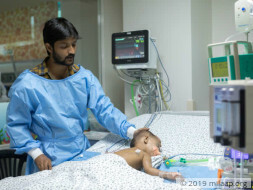 Ismail and his wife ran around hospitals in their hometown in Aurangabad after finally deciding to get her treated in Hyderabad which is over 300 kilometres away. 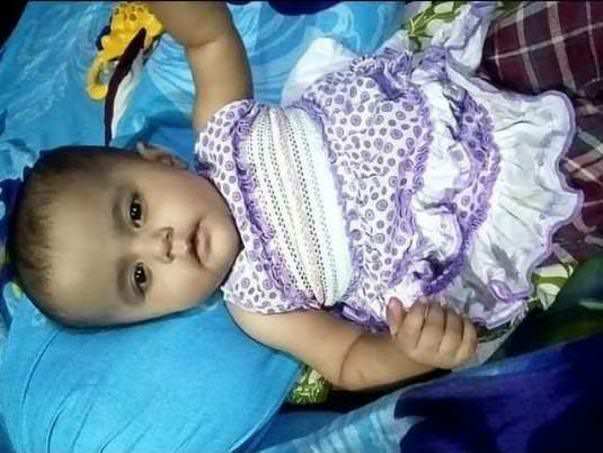 Since she’s unable to breathe on her own, Junera needs to be aided by a powerful ventilator for an additional 3 weeks. This is her only hope of survival. 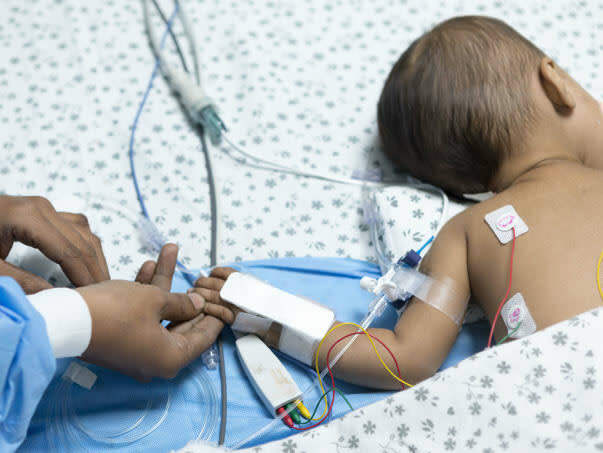 She has been through a lot at the age of just 18 months and now, even after she stabilizes she needs additional treatment, which is to be still decided. 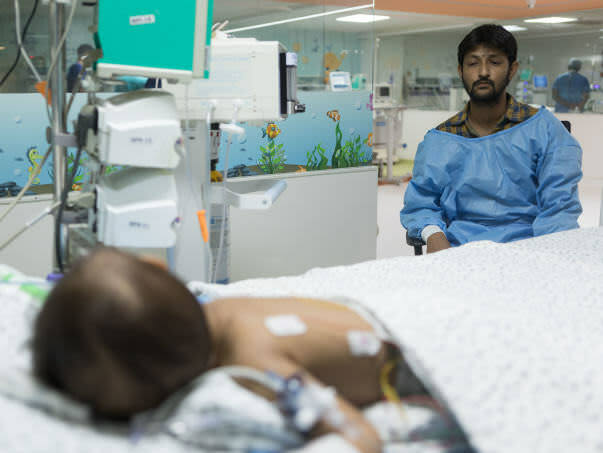 She is very critical and battling for her life but her father has absolutely nothing left to provide for the life-saving treatments she needs now. He is running out of time and is in dire need of help. Ismail works as a labourer and salesperson at a small cloth shop in Aurangabad. He earns a meagre sum of Rs 6000 per month. With this he has to provide for a family of 4; his wife, elder daughter, Alira, Junera, and himself. In just a few weeks, he has already spent a total of Rs 2.5 lakhs and has exhausted all his savings in the process, in addition to begging and borrowing from others. The total cost of the additional life-saving treatments that 18-month-old Junera requires in the PICU is estimated to be around Rs 15 lakhs. Ismail, simply put, cannot afford this even if he worked for decades. Now, he is left with no option but crowdfunding. 18-month-old Junera is fighting for her life in the PICU. She is suffering from severe pneumonia and she has hopes of recovery if she remains there for the next few weeks. 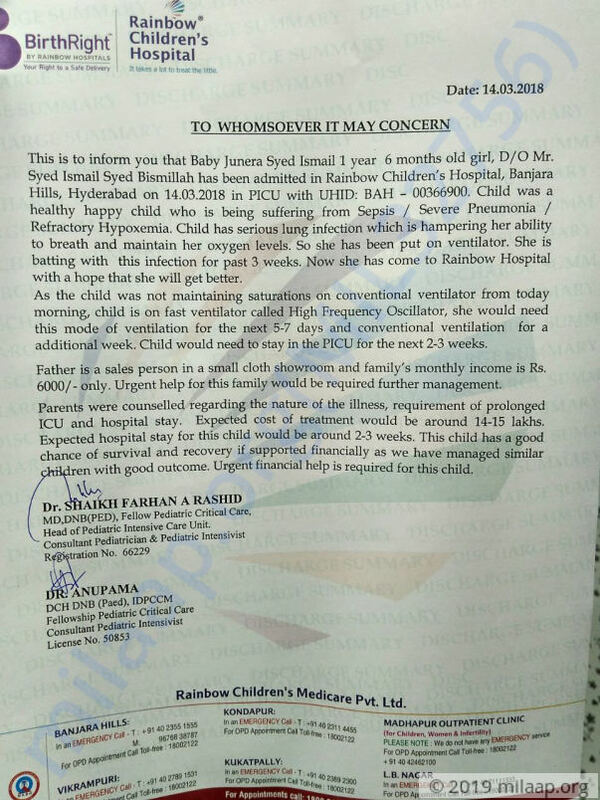 Her father, being extremely poor, has nothing left to help her and needs your support to save his baby’s life. We have some unfortunate news to share with you all, Baby Junera passed away on March 16th during the late night hours. She was in PICU during her last few days. Doctors reported that the cough was spread in her chest, they tried their best to save her but due to severe breathing problems, her heartbeat stopped. The little soul fought very hard but she couldn't make it, whole family is devastated. All the funds have been utilized for her medical expenses so far. Please do pray that her soul finds peace. We thank you for all the love and support you have shown towards her and her family. God bless you with speedy recovery! !